Beijing VEIKK E-Commerce Co.,Ltd specializes in manufacturing affordable pen tablets and pen displays. Whether you’re a beginner or professional, chances are you’ll find a tablet to suit your needs. VEIKK has helped artists in more than 30 countries to better express themselves while creating opportunities to make their digital art come alive! VEIKK’S mission is to provide the best drawing solution for their global audience, a mission that SketchCop® Solutions also shares. So, whether you’re drawing the VEIKK way, to “FREE Your Mind”, or “Drawing Dangerously” like The SketchCop®, chances are you’ll find your preferred digital tool on the page below. 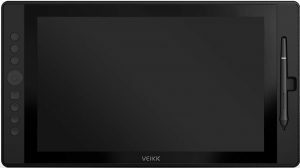 VEIKK’S pen tablets are suitable for drawing, sketching, image editing, industrial design, gaming, cartoon design, signatures & online education and much, much more. Whether you’re a serious artist, or doodler VEIKK’s S640 pen tablet is great for the home studio or other small workspaces. An ultra-slim design and small footprint, makes the S640 the perfect ‘on-the-go’ tablet to take with you on the road. Easy-to-Use, Plug & Play USB interface. Small and compact, it takes up little space on your desktop or can be easily balanced on your lap. Intelligent Passive Battery-free Pen with 8192 level pressure sensitivity, NO NEED TO CHARGE. This allows for uninterrupted draw and play. Resolution at 5080 LPI with a report rate of 230 pps. Compatible with Windows XP/Vista 10/8/7 OS, Mac 10.8 or above. NOTE: Apple has recently upgraded to Mac OS Mojave 10.14. Please visit: www.VEIKK.com and read the FAQ to learn more. Also compatible with many major design software such as Photoshop®, Painter®, Illustrator®, Clip Studio, and more. VEIKK’s A30 pen tablet is an intermediate-level digital drawing tool. The A30 is perfect for desktop use, and because of its size is easily portable. Smart Gesture Touch and four Shortcut Keys allows the user to customize individual shortcuts to create a smooth workflow that helps improve time and efficiency, making VEIKK’s A30 pen tablet the perfect tool for those who enjoy: sketching, drawing, painting, inking and sculpting. 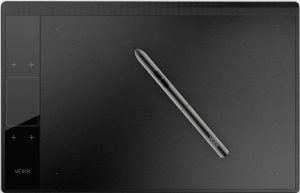 So, whether you’re a serious artist, or hobbyist, the A30 pen tablet is an affordable and reliable solution for those entering the digital space. Ultra-large, 10×6 inch active drawing area. This gives you a more sensitive platform and more space where you can show off your creativity and talent. 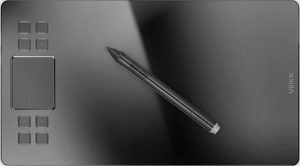 Intelligent Passive Pen Technology. 8192 levels of pressure. Battery-free with smart chip. No need to charge, allowing for uninterrupted drawing and play. Trace line trajectory & Automatic line correction. Tablet surface offers a paper-like feeling. Drivers are compatible with Mac and Windows OS. NOTE: Apple has recently upgraded to Mac OS Mojave 10.14. Please visit: www.VEIKK.com and read the FAQ to learn more. VEIKK’s A50 pen tablet is an intermediate-level digital drawing tool. The A50 is perfect for desktop use, and because of its size is easily portable. Smart Gesture Touch and eight Shortcut Keys allows the user to customize even MORE individual shortcuts to create a smooth workflow that helps improve time and efficiency. This makes VEIKK’s A50 pen tablet the perfect tool for creating more projects, in less time. 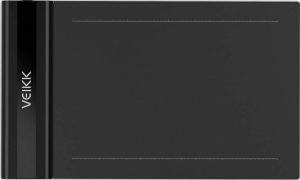 So, whether you’re a serious artist, or hobbyist, the A50 pen tablet is an affordable and reliable solution for those entering the digital space. 8 programmable, customized shortcut keys and 1 gesture touch pad will almost replace keyboard functions. VEIKK’S pen displays are ideal for drawing, sketching, image editing, fashion design, animation, photography, 3D sculpting, architecture design and more. Sketch, paint, and design directly on your monitor’s surface! Our sleek tablet monitors are designed to enhance your art skills by letting you draw naturally with all the advantages of a digital medium. VEIKK’s VK1560 graphic display is an advanced-level digital drawing tool that’s intuitive and easy-to-use. Its rotating dial and seven shortcut or ‘Hot’Keys allows the user to customize preferred shortcuts to create a smooth workflow that helps improve time and efficiency. Overall, the VK1560 graphic display is the perfect tool for the serious artist who wants to create more projects, in less time. It’s the perfect tool to use for professional grade sketching, drawing, painting, inking and sculpting for artists who want high-quality on a budget. Don’t worry. You don’t have to be a pro to use this affordable and reliable graphic display. Plus, with its built-in holder, you won’t misplace your pen stylus either. So, whether you’re a serious artist, or hobbyist, the VK1560 graphic display is the perfect solution for artists who want to take their art to the next level. IPS Pen Display with enhanced display feature for a more accurate color spectrum. 94% Adobe RGB, increases the color accuracy of your images. Battery-free stylus pen with 8192 levels of pressure sensitivity. Our pen is highly responsive with NO NEED TO CHARGE. This ensures uninterrupted using. Convenient one-click toggle to switch from pen to eraser tools. Multiple-Tilt Adjustment allows for the perfect drawing angle. 7 customized Hot Keys and an upgraded Quick Dial allow for a variety of unique customization options. Unique Pen holder design on the right side of the monitor makes ensure you won’t misplace your pen.